I’ve always enjoyed eating at Gars. 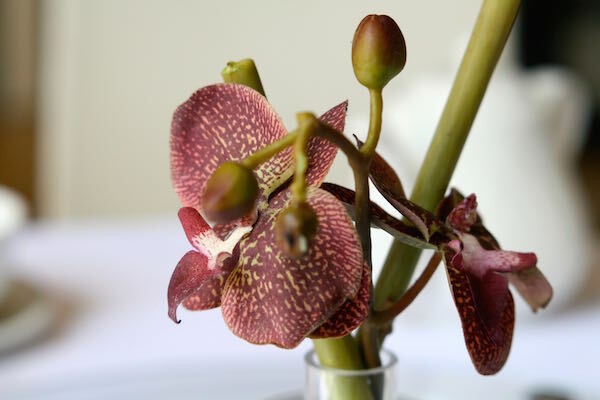 The food and décor are both stylish and well executed, while the service is slick and seamless. It’s no surprise it’s been open for such a long time – an impressive 32 years to be precise. Such an enticing combination of qualities has made Gars what it is today; one of Brighton’s most established and respected restaurants. 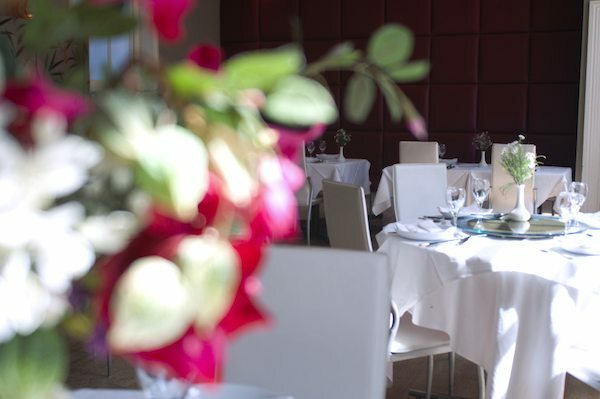 Gars – one of Brighton’s most established and respected restaurants. A lot of older, long-running restaurantss rest on their laurels, sticking to the same tried-and-tested formula. But Gars has done the opposite and remained popular over the years by keeping things fresh and exciting. The fact that Gars is a family-run business is a crucial ingredient in its recipe for success. After so many years the Gars family know their industry inside out; they’re passionate about high quality food and are able to deliver this on a continual basis due to being such a familiar, tight-knit team. 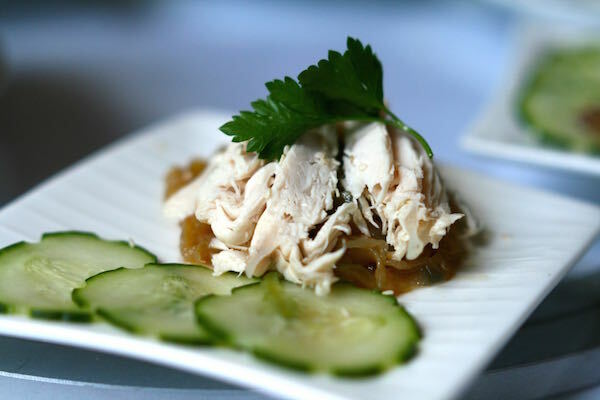 The food is a combination of both classic and modern Chinese dishes – more fine dining than you’ll find in other places – interspersed with other Asian favourites, such as the hot and spicy Thai seafood Tom Yum soup and various Thai curries. Until recently, diners at lunchtimes made their selection from a Set Menu. But the Gars felt it was time for a change so they’ve now replaced that with a brand new, innovative dim sum that seems to be going down well with the loyal lunch crowd. 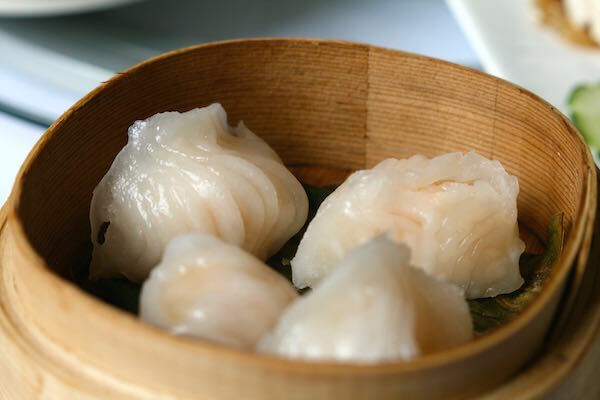 For those of you unfamiliar with dim sum, the term refers to the Cantonese custom of serving small individual portions of food that have been steamed, baked or fried. 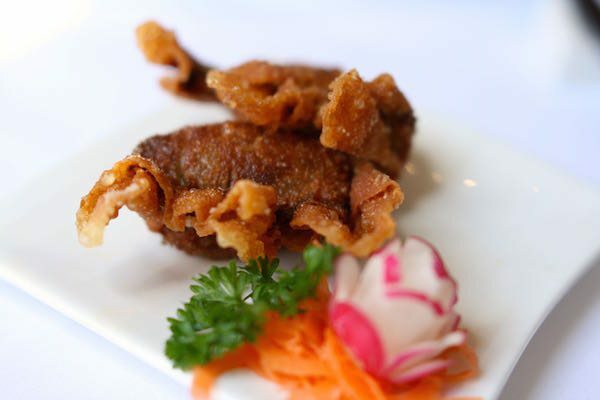 For most people, dim sum means dumplings – and there’s definitely a good selection of those on the new menu at Gars – but there’s also a wide variety of other non-dumpling dishes on there too, including ample choice for those following a gluten-free diet. When one truly experiences dim sum, as is now possible at Gars, it’s a convivial, relaxing experience. Everything on the table is meant to be shared and enjoyed together. That’s why portions are kept small and reasonably priced, so that it’s possible to order a number of different dishes to share and therefore try a variety of flavour combinations. It’s OK to order as little or as much as you like – dim sum is ideal for lunch because it doesn’t leave you feeling too heavy or overwhelmed. To kick-start our meal we were brought a highly-scented bowl of oxtail braised with five spice and star anise, a ‘glutinous rice in lotus leaf’ with chicken, pork and Chinese mushrooms, a plate of seaweed salad in a chilli and sesame dressing, an exotic-sounding jelly fish and chicken salad with a sesame peanut dressing and a plate of crispy brown aubergine and beancurd wun tun. Alongside those dishes were given some dipping sauces – Chinese red wine vinegar, a hot chilli oil, a milder sweet chilli dressing and a sweet and sour sauce. We were also given a pot of jasmine tea to help us digest the food. For a moment, I wasn’t sure where or how to start. Everything on the table looked so incredible; each dish artfully presented but utterly different to the next. 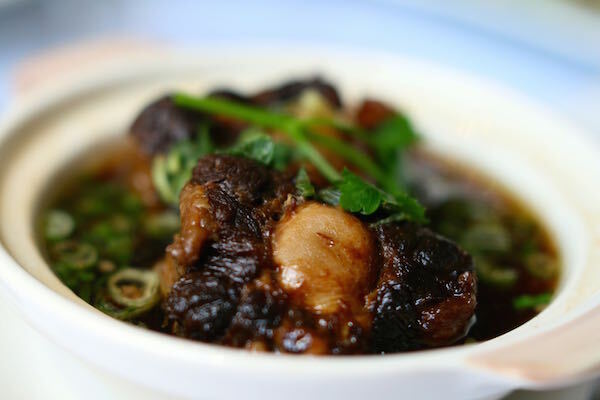 My dining companion Mr RB and I plunged our spoons into the dark hunks of oxtail sitting in a bowl of steaming hot pungent broth with a generous scattering of greens. The oxtail and broth smelled so heavenly it was impossible to resist – the combination of spices with the star anise in the beefy broth and the rich unctuous meat was amazing. 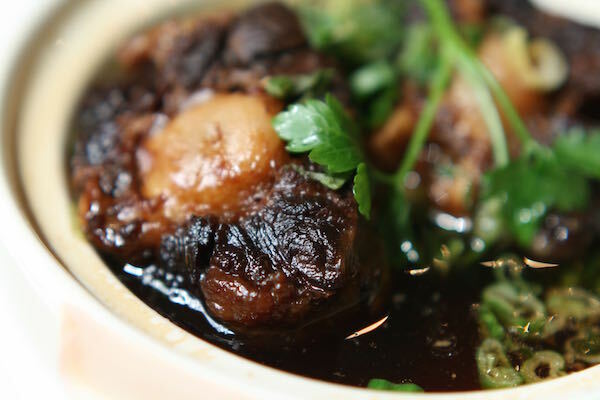 The oxtail had been braised so perfectly it fell apart to the touch and virtually melted in the mouth. Alongside that we ate ‘glutinous rice’; sticky rice studded with chunks of chicken, pork and mushrooms, which reminded me of a Chinese version of a risotto. It was creamy, savoury, earthy and delicious; an ideal partner to the oxtail. To refreshen my palate after such intense flavours I tried the seaweed salad in chilli and sesame dressing, which was fresh, light and slightly crunchy. After that I decided to give the jellyfish salad a go, although I was a tad trepidatious I must admit. 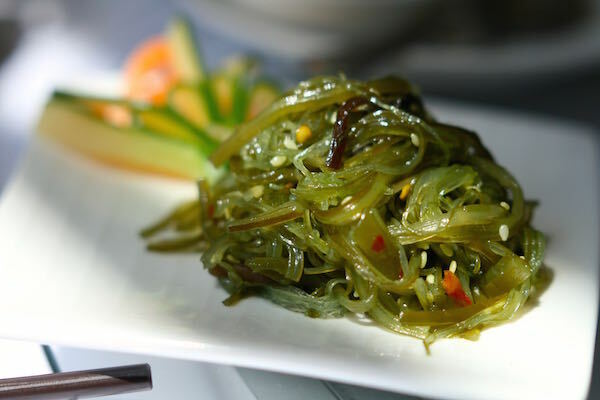 Despite my initial reservations I was pleasantly surprised – in many ways it was like the seaweed salad in texture and taste, which I guess isn’t surprising. The sliced chicken and sesame brought contrasting flavours that were softer and creamier, which as a combination worked really well. The baby squid was a totally different experience again. It had been quickly fried in a light and crispy batter made from a mix of flour, salt, pepper, chilli and spring onion and was hot, sweet, crispy, spicy and salty – a delicious jolt of flavours that made me sit up straight. Next we tried two different steamed dumplings; Siu Mai containing coarsely chopped pork and prawn meat that had been mixed with herbs and wrapped in the thinnest wun tun pastry. They were really good; light but also quite meaty and herby. Alongside those we tried the Har gow dumplings with prawns and bamboo shoots. They were slightly more doughy than the Siu Mai; delicate and gently sweet. I really loved both of these dumpling dishes and would definitely order them again. The marinated aged pork and sausage on rice had much bolder flavours. I’m a fan of pork in all guises – I love hams, salamis and all types of sausage – and this choice really hit the mark. Pork pairs so well with Chinese spices which bring out the meat’s sweetness and the sausage added a spiciness that made the dish much more interesting. We also enjoyed the steamed buns filled with roast char siu pork and barbecue sauce. 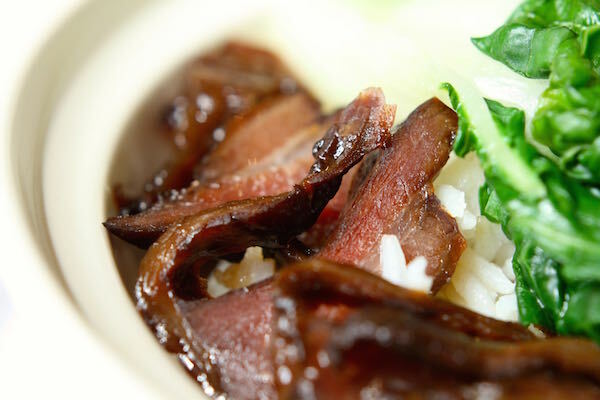 This was yet another example of a well-executed classic Cantonese favourite. The beef brisket in noodle soup was another strong dish. As with the oxtail at the start of our meal, the beef had been cooked really slowly so the flavours and texture were just as they should be. To round off our meal with something sweet we chose two different types of white steamed bun; one filled with cream custard and the other with lotus seed paste. Again, both of these dishes are well-known classics and it was lovely to end our meal in this way – with something light, sweet and quite traditional. With our appetites fully satiated we ended the meal, both feeling as if we’d given the dim sum a very fulsome run-through. I love this way of eating and the variety than one can enjoy at Gars so shall be returning for more soon. 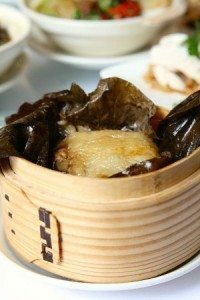 If you’re already a dim sum fan – or you’ve never eaten it before – this new menu comes highly recommended. 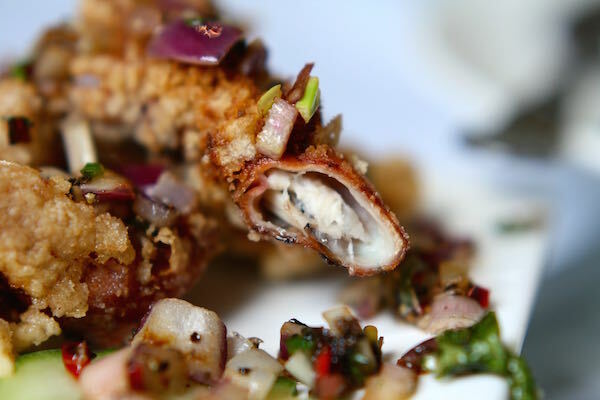 Gars has brought something fresh to Brighton’s lunch scene and that shouldn’t be missed!